Truck accidents can have a devastating effect on the victims and their families. The level of harm resulting from a truck accident is often much more severe, and a person in a truck accident is more prone to sustain a serious injury. The assistance of an experienced attorney is important to recover appropriate financial compensation to cover medical costs, loss of wages and other expenses, as well as for pain and suffering, and disability. 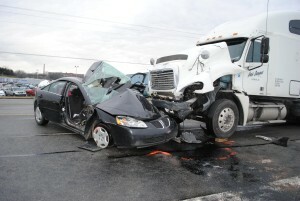 A lawyer’s extensive experience in handling personal injury cases is critical to obtaining equitable compensation for victims of truck accidents. Personal injury claims involving truck accidents are often complicated by federal regulations and the fact that most commercial vehicles are owned by companies that can afford to spend large sums defending a case. In these instances a skilled lawyer who is familiar with navigating these factors can be of great benefit. My experience has earned the trust and confidence of my clients throughout Illinois. After a Chicago truck accident, it is not always clear who is at fault. In most cases, a detailed investigation is required to get a clear answer. Although it may seem obvious that the truck driver was the one to blame, they might not be the only party responsible. Truck driver fatigue: truckers sometimes violate rest break laws, causing them to stay on the road even when they are past the point of fatigue. Investigations can uncover phony logbooks, showing the illegal hours the driver really worked. Truck driver negligence: trucking companies and their insurance companies act quickly to protect themselves and their drivers from liability after an accident. Black box data recorders can be tampered with if not promptly preserved. Product defects: you should not automatically assume that the truck driver was at fault. The accident may have been caused by defective vehicle design or faulty component parts, making the manufacturer of that part the liable party. Trucking law violations: all truck drivers in the country are required to abide by federal trucking laws, which dictate how long a driver is allowed to work without taking a break and how often they must maintenance their vehicle. Large commercial trucks like tractor-trailers, big rigs, or eighteen-wheelers weigh up to 20 times as much as a passenger car, virtually guaranteeing that they’ll crush smaller vehicles in an accident. Worse, some truckers and trucking companies, in an effort to maximize profits and make their deadlines, ignore safety regulations. 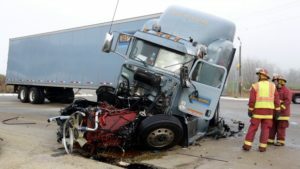 Victims of truck accidents — those in or outside the truck — are likely to be killed or sustain brain damage,spinal injuries, amputations and other very serious injuries. Truckers and trucking companies routinely ignore those laws in order to meet strict delivery deadlines. Sometimes, that leads to truckers piloting ten-ton vehicles on very little sleep or taking drugs to stay awake. At other times, trucking companies fail to maintain brakes, tires, lights and other equipment, putting their own drivers and everyone around them at risk of a serious truck accident. Some unscrupulous companies knowingly employ cheap but unqualified drivers who never earned a commercial driver’s license in the first place. Federal statistics show that large trucks – like big rigs and 18-wheelers – are only three percent of the vehicles on our roads but are involved in 12 percent of traffic fatalities. 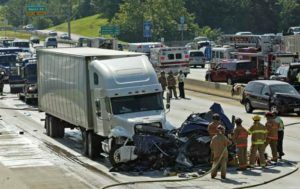 Truck operators must abide by various federal and state regulations that govern vehicles engaged in interstate traffic, adding complexity to the already difficult issue of injury liability. With the anxiety that comes in the aftermath of a truck accident, there is little time for understanding the significance of these rules. My experience in truck accident cases can help you understand these regulations and determine their proper application to your individual case. Call me today at 312-375-6524 for a free consultation on your trucking accident case. I am a Chicago Truck Accident Attorney who will help and will fight for you every step of the way.